April 19, 2013 - With open head design, Q Ties enable installation in areas of limited visibility or while working with gloves. Ribbed tail contributes to ergonomic installation, while integrated pre-lock function permits temporary hold, making it suitable for applications where supplementary cables need to be added to cable runs prior to final assembly. Q Mounts, designed to work with cable ties, are available with adhesive, or can be secured with screws, and Q Tags are used for labeling cables and wire bundles. 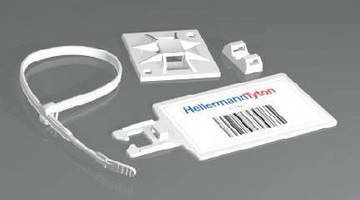 Milwaukee, WI -- HellermannTyton (www.hellermann.tyton.com), a diversified manufacturer of best-in-class cable management products for securing, protecting and identifying wires, cables and connecting components, introduces the Q Series cable tie system. The patented Q Tie features an open-head design which makes installation unprecedentedly easy. With the same high reliability as HellermannTyton’s closed head cables, the Q Ties enable effortless installation in areas of limited visibility or while working with gloves. The Q Tie also features an integrated pre-lock function that permits a temporary hold, making it the most efficient option for applications where supplementary cables need to be added to cable runs prior to final assembly. The Q Tie’s design also incorporates a large ribbed tail which contributes to the easy and ergonomic installation of the tie. The Q Tie is complemented by Q Mounts and Q Tags. Q Mounts are designed to work exclusively with the Q Tie cable tie series. This mount is available with adhesive, or can be secured with screws. The Q Mount allows either a 2- or 4-way entry for the Q Tie.IPEX cables,Custom cable,LCD cable,MCX cables. Q Tags are used in conjunction with the Q Tie cable tie series for labeling cables and wire bundles. The Q Tie is simply inserted through the Q Tag opening, providing a quick identification solution that also securely fastens the cable or wire bundle. The Q Tag can be marked using a felt tip pen, or by applying a thermal transfer label that has been pre-printed using the TagPrint Pro 3.0 label creation software and a HellermannTyton thermal transfer printer.